CATAFOR 101 CATAPHORETIC PAINT NEUTRAL BATHThe CATAFOR 100 line is a transparent and colored cataphoretic painting process capable of covering in a uniform and lasting way any metal object that needs protection from oxidizing and chemical agents. CATAFOR 100 in order to be used requires a special..
CATAFOR 102C RED COLOR BATH The CATAFOR 100 line is a transparent and colored cataphoretic painting process capable of covering in a uniform and lasting way any metal object that needs protection from oxidizing and chemical agents. 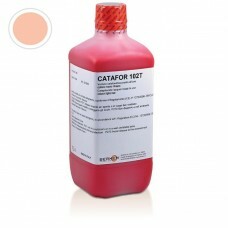 CATAFOR 100 in order to be used requires a special current re..
CATAFOR 102T LIGHT RED COLOR BATHThe CATAFOR 100 line is a transparent and colored cataphoretic painting process capable of covering in a uniform and lasting way any metal object that needs protection from oxidizing and chemical agents. CATAFOR 100 in order to be used requires a special current r..
CATAFOR 103C BLUE COLOR BATHThe CATAFOR 100 line is a transparent and colored cataphoretic painting process capable of covering in a uniform and lasting way any metal object that needs protection from oxidizing and chemical agents. 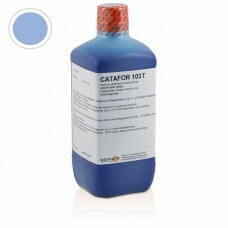 CATAFOR 100 in order to be used requires a special current rectif..
CATAFOR 103T LIGHT BLUE COLOR BATHThe CATAFOR 100 line is a transparent and colored cataphoretic painting process capable of covering in a uniform and lasting way any metal object that needs protection from oxidizing and chemical agents. 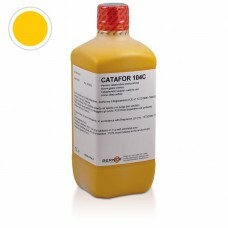 CATAFOR 100 in order to be used requires a special current ..
CATAFOR 104C YELLOW COLOR BATHThe CATAFOR 100 line is a transparent and colored cataphoretic painting process capable of covering in a uniform and lasting way any metal object that needs protection from oxidizing and chemical agents. 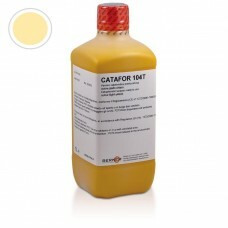 CATAFOR 100 in order to be used requires a special current rect..
CATAFOR 104T LIGHT YELLOW COLOR BATHThe CATAFOR 100 line is a transparent and colored cataphoretic painting process capable of covering in a uniform and lasting way any metal object that needs protection from oxidizing and chemical agents. CATAFOR 100 in order to be used requires a special curren..
CATAFOR 105C GREEN COLOR BATHThe CATAFOR 100 line is a transparent and colored cataphoretic painting process capable of covering in a uniform and lasting way any metal object that needs protection from oxidizing and chemical agents. CATAFOR 100 in order to be used requires a special current recti..
CATAFOR 105T LIGHT GREEN COLOR BATHThe CATAFOR 100 line is a transparent and colored cataphoretic painting process capable of covering in a uniform and lasting way any metal object that needs protection from oxidizing and chemical agents. CATAFOR 100 in order to be used requires a special current..
CATAFOR 106C BLACK COLOR BATH The CATAFOR 100 line is a transparent and colored cataphoretic painting process capable of covering in a uniform and lasting way any metal object that needs protection from oxidizing and chemical agents. 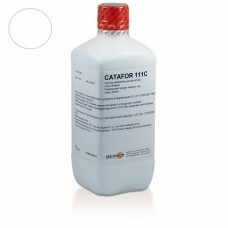 CATAFOR 100 in order to be used requires a special current ..
CATAFOR 106T GRAY COLOR BATHThe CATAFOR 100 line is a transparent and colored cataphoretic painting process capable of covering in a uniform and lasting way any metal object that needs protection from oxidizing and chemical agents. CATAFOR 100 in order to be used requires a special current rectif..
CATAFOR 107C PURPLE COLOR BATHThe CATAFOR 100 line is a transparent and colored cataphoretic painting process capable of covering in a uniform and lasting way any metal object that needs protection from oxidizing and chemical agents. 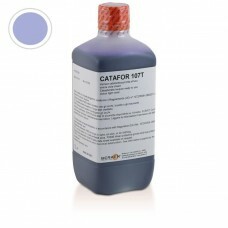 CATAFOR 100 in order to be used requires a special current rect..
CATAFOR 107T LIGHT PURPLE COLOR BATHThe CATAFOR 100 line is a transparent and colored cataphoretic painting process capable of covering in a uniform and lasting way any metal object that needs protection from oxidizing and chemical agents. 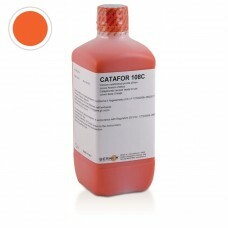 CATAFOR 100 in order to be used requires a special curren..
CATAFOR 108C ORANGE COLOR BATHThe CATAFOR 100 line is a transparent and colored cataphoretic painting process capable of covering in a uniform and lasting way any metal object that needs protection from oxidizing and chemical agents. CATAFOR 100 in order to be used requires a special current rect..
CATAFOR 108T LIGHT ORANGE COLOR BATHThe CATAFOR 100 line is a transparent and colored cataphoretic painting process capable of covering in a uniform and lasting way any metal object that needs protection from oxidizing and chemical agents. CATAFOR 100 in order to be used requires a special curren..
CATAFOR 109C LILAC COLOR BATHThe CATAFOR 100 line is a transparent and colored cataphoretic painting process capable of covering in a uniform and lasting way any metal object that needs protection from oxidizing and chemical agents. 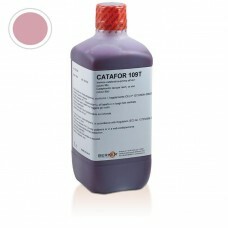 CATAFOR 100 in order to be used requires a special current recti..
CATAFOR 109T LIGHT LILAC COLOR BATHThe CATAFOR 100 line is a transparent and colored cataphoretic painting process capable of covering in a uniform and lasting way any metal object that needs protection from oxidizing and chemical agents. CATAFOR 100 in order to be used requires a special current..
CATAFOR 110C LIME GREEN COLOR BATHThe CATAFOR 100 line is a transparent and colored cataphoretic painting process capable of covering in a uniform and lasting way any metal object that needs protection from oxidizing and chemical agents. CATAFOR 100 in order to be used requires a special current ..
CATAFOR 110T LIGHT LIME GREEN COLOR BATHThe CATAFOR 100 line is a transparent and colored cataphoretic painting process capable of covering in a uniform and lasting way any metal object that needs protection from oxidizing and chemical agents. 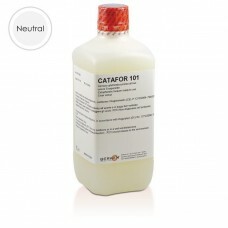 CATAFOR 100 in order to be used requires a special cu..
CATAFOR 111C WHITE COLOR BATHThe CATAFOR 100 line is a transparent and colored cataphoretic painting process capable of covering in a uniform and lasting way any metal object that needs protection from oxidizing and chemical agents. CATAFOR 100 in order to be used requires a special current recti..
CATAFOR 112C DEEP TURQUOISE COLOR BATHThe CATAFOR 100 line is a transparent and colored cataphoretic painting process capable of covering in a uniform and lasting way any metal object that needs protection from oxidizing and chemical agents. CATAFOR 100 in order to be used requires a special curr..
CATAFOR 112T LIGHT TURQUOISE COLOR BATH The CATAFOR 100 line is a transparent and colored cataphoretic painting process capable of covering in a uniform and lasting way any metal object that needs protection from oxidizing and chemical agents. CATAFOR 100 in order to be used requires a speci..
CATAFOR 113C DEEP BROWN COLOR BATHThe CATAFOR 100 line is a transparent and colored cataphoretic painting process capable of covering in a uniform and lasting way any metal object that needs protection from oxidizing and chemical agents. CATAFOR 100 in order to be used requires a special current ..
CATAFOR 113T LIGHT BROWN COLOR BATHThe CATAFOR 100 line is a transparent and colored cataphoretic painting process capable of covering in a uniform and lasting way any metal object that needs protection from oxidizing and chemical agents. 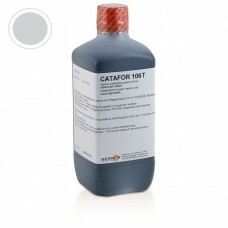 CATAFOR 100 in order to be used requires a special current..
CATAFOR 401H HIGH THICKNESS NEUTRAL COLOR BATHCATAFOR 400 is a line of high performance cataphoretic paints able to deposit films that are incredibly transparent and resistant to chemicals and wear. CATAFOR 400 includes low or high thickness paints, depending on whether you want to obtain a thin ..
CATAFOR 401L LOW THICKNESS NEUTRAL COLOR BATHCATAFOR 400 is a line of high performance cataphoretic paints able to deposit films that are incredibly transparent and resistant to chemicals and wear. 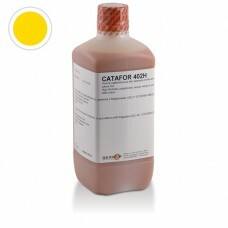 CATAFOR 400 includes low or high thickness paints, depending on whether you want to obtain a thin p..
CATAFOR 402H HIGH THICKNESS GOLD COLOR BATHCATAFOR 400 is a line of high performance cataphoretic paints able to deposit films that are incredibly transparent and resistant to chemicals and wear. CATAFOR 400 includes low or high thickness paints, depending on whether you want to obtain a thin pro..
CATAFOR 403H HIGH THICKNESS BRONZE COLOR BATHCATAFOR 400 is a line of high performance cataphoretic paints able to deposit films that are incredibly transparent and resistant to chemicals and wear. CATAFOR 400 includes low or high thickness paints, depending on whether you want to obtain a thin p..
CATAFOR 403HM MATT BRONZE COLOR BATHCATAFOR 400 is a line of high performance cataphoretic paints able to deposit films that are incredibly transparent and resistant to chemicals and wear. CATAFOR 400 includes low or high thickness paints, depending on whether you want to obtain a thin protective..
CATAFOR 404H HIGH THICKNESS RUBY RED COLOR BATHCATAFOR 400 is a line of high performance cataphoretic paints able to deposit films that are incredibly transparent and resistant to chemicals and wear. CATAFOR 400 includes low or high thickness paints, depending on whether you want to obtain a thin..
CATAFOR 404HM OPAQUE RUBY RED COLOR FOR BATHCATAFOR 400 is a line of high performance cataphoretic paints able to deposit films that are incredibly transparent and resistant to chemicals and wear. CATAFOR 400 includes low or high thickness paints, depending on whether you want to obtain a thin pr..
CATAFOR 405H HIGH THICKNESS BLACK COLOR BATHCATAFOR 400 is a line of high performance cataphoretic paints able to deposit films that are incredibly transparent and resistant to chemicals and wear. CATAFOR 400 includes low or high thickness paints, depending on whether you want to obtain a thin pr..
CATAFOR 405HM MATT BLACK COLOR BATHCATAFOR 400 is a line of high performance cataphoretic paints able to deposit films that are incredibly transparent and resistant to chemicals and wear. CATAFOR 400 includes low or high thickness paints, depending on whether you want to obtain a thin protective ..
CATAFOR 406H HIGH THICKNESS BLUE COLOR BATHCATAFOR 400 is a line of high performance cataphoretic paints able to deposit films that are incredibly transparent and resistant to chemicals and wear. CATAFOR 400 includes low or high thickness paints, depending on whether you want to obtain a thin pro..
CATAFOR 406HM MATT BLUE COLOR BATHCATAFOR 400 is a line of high performance cataphoretic paints able to deposit films that are incredibly transparent and resistant to chemicals and wear. 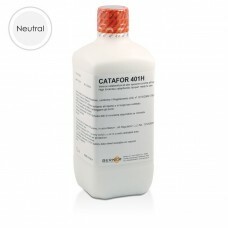 CATAFOR 400 includes low or high thickness paints, depending on whether you want to obtain a thin protective l..